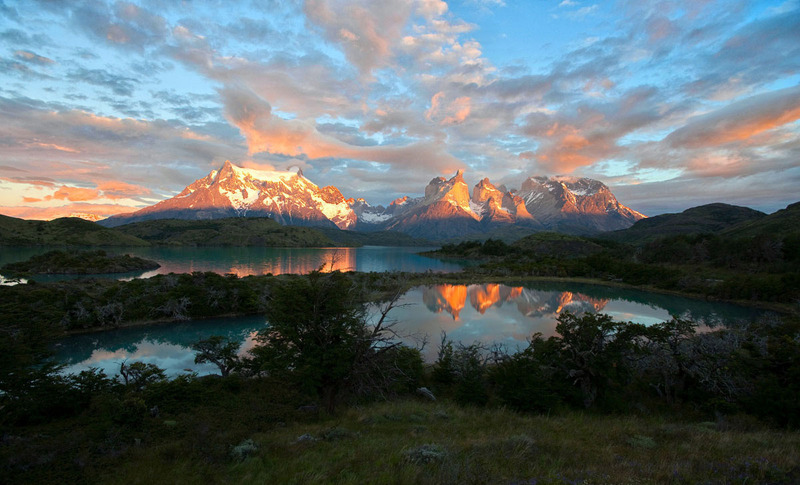 The place "Patagonia" is emblazoned in the minds of many who love the outdoors, yet the specifics are more of a mystery. Even the borders are not strictly defined—the region encompasses the large cone-shaped landmass at the southern end of South America shared between Chile and Argentina. Rough boundaries are Argentina’s Neuquén province in the north and Chile’s Cape Horn on the Tierra del Fuego Archipelago in the south. This area contains some of the most impressive and rugged terrain on earth. The Andean Cordillera runs the length of Patagonia and creates a constantly changing backdrop of jagged peaks. The Southern Patagonia Ice Fields, the world’s third-largest frozen landmass after Antarctica and Greenland, feed a complex system of glaciers, milky blue lakes lined with icebergs, and powerful rivers. Southern Patagonia is wind-whipped and extreme; northern Patagonia is more temperate and lush with volcanoes and monkey puzzle trees. It’s true that Patagonia isn’t quite as as far-flung as it once was. Torres del Paine National Park in Chile and the Perito Moreno glacier in Argentina, in particular, have seen steady increases in tourism. Upscale hotels and good restaurants are more commonplace than ever before. But Patagonia has retained a far-off frontier feel, and the places most people visit represent only a tiny fraction of all that there is to explore. Below are the prime areas of interest for those traveling to Patagonia, along with valuable trip planning information that is tough to come by for the region. Switchback Travel has not yet been to Antarctica, but we have been organizing information, talking with people who have, and keeping an eye out for good leads. With perfect timing..